AED 3D Printing Moon Lamp BackyardToolshed - All your tool needs in one place! Here we are with moon lamp number 2 and it’s already starting to get better. Picking out the right lamp for your lighting or decorating needs can really be quite confusing, especially with the wide range of available ones out in the market today. For a full overview of the most popular moon lamps, check our Moon Lamp review. Small ones are adorable and great for people who are into minimalism, but sometimes big is better. With AED’s 7.3 inches Large Moon Light, you can enjoy your own moon a bit more extravagantly. Using satellite data sourced from NASA itself and the latest 3D printing technology, this AED Moon Lamp is sure to give you a breathtaking feeling. It gives off an unbelievable 360-degree light beam which simulates a moonlight experience. It’s as if you were out on the woods gazing at the real moon, but this one’s something you can appreciate better by touching and holding it. Equipped with a Touch Sensor Switch and Dimmable Brightness, the AED Moon Lamp is definitely beautiful and functional. It has 2 LED light colors featuring a cool white and a warm light, so you could choose between two settings to set the mood. With a short touch on the lamp’s metal switch, you can turn on the lamp’s touch sensor. You can now control your moon lamp’s light colors from cool to warm. Another long touch to the moon lamp will allow you to adjust its brightness. Once you’re ready to select a brightness level, simply release the touch. The AED Moon Lamp can also save the last brightness setting you used thanks to its brilliant memory function. Now, that’s a smart lamp! The AED Moon Lamp comes in a complete package including a 4-feet long USB charging cable, a wooden mount to place your lamp in, and a user’s manual to learn more about using and caring for your moon lamp. In terms of specifications, the AED Moon Lamp’s battery has a capacity of 500 mAh. Charging your moon lamp is through the use of the USB charging cable it comes with and plugging it into your computer or any USB charging hub. This may take between 2 to 3 hours, but don’t worry, since it will let you know when it’s done through a red light. Once fully charged, you can use the moon lamp for about 8 to 12 hours. Keep in mind that this may differ depending on which brightness you regularly set it to. What it means is that when you keep a low brightness setting to your moon lamp, you can enjoy it unplugged for a longer time. On the other hand, keeping it at full brightness would mean more charging sessions. It’s important to use your moon lamp carefully so you could enjoy it for, hopefully, as long as we have been enjoying the moon above. 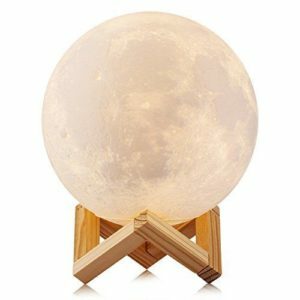 This moon lamp is a wonderful choice for your home. The AED Moon Lamp also works great as a present so you could give the gift of whimsy to kids and adults alike. It comes in an elegant gift box, that is suitable for all occasions, so it’s all set to bring joy to anyone’s home.